Enjoy wireless audio freedom with these MH2001 5-in-1 Hi-Fi S-XBS Wireless Headphones. 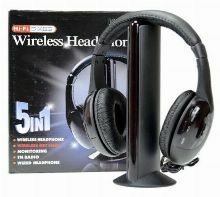 They feature comfortable padding so you can wear them for hours on end to listen to audio from all sorts of devices--from PCs and televisions to MP3, CD, and DVD players in both wired and wireless configurations. A built-in FM receiver lets you listen to your favorite radio stations and the included built-in microphone lets you chat online or even monitor audio in another room.